When was the last time you had one of those--in Oprah’s words--”aha!” moments? When was the last time you were truly in tune with what was going on inside your being—mind, body and soul? When was the last time you felt fully present and self-aware? Self-Awareness may not be something you spend much time thinking about, and, therefore, don’t spend much time developing. But it’s worth the investment. It’s a trait that allows you to explore and really come to understand your inner self. Self-Awareness not only allows you to understand why you think and do the things you do, it also empowers you to analyze decisions holistically so you can start making those that make you feel happy and fulfilled. Here are a few quick and easy journal writing prompts to help you get in touch with your inner self. 1. Open your journal to a fresh page and write the date. Now write at the top of the page “In this moment, I am aware that...” and just write, write, write until you feel it’s right for you to stop. 2. Think about some of the big concepts in life that are difficult to define. What does courage mean to you? What does faith mean to you? What does strength mean to you? What does compassion mean to you? Tell your journal, and be specific. Write a personal story to illustrate each concept if you can. 3. Describe your idea of perfect health and happiness in as much detail as possible. When you close your eyes and imagine it, what does it look like? What is most essential to this happiness? 4. Fast forward a few decades, or even a century. After you’re gone, how would you like to be remembered? What do you want your legacy to be? How does that affect who you are right now? 5. If you could do anything, what would it be? What excites you about these possibilities? What’s holding you back? 6. Ask yourself: Who am I today? Write down everything that comes to mind. Take this free Self-Awareness Test to discover what you need to work on. You'll be surprised...I know I was! 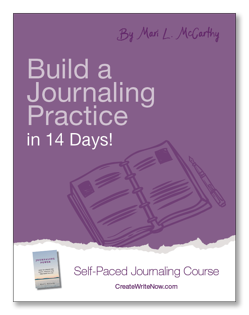 Need a jumpstart for your journaling practice? 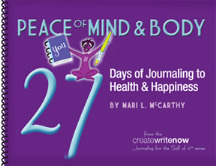 Get Create Write Now's Build a Lasting Journaling Practice in 14 Days Workbook.